There are stories written in the skin of my arms. The language is silent and perhaps only I can interpret it, but when I trace the lines I read a history of the most formative relationships in my first fifteen years: my daddy, my mother, my older sisters, and my self. 1) A small brown dot about the size of a pinhead has been on my wrist for as long as I can remember. Before I was old enough to go to school, one of my sisters used it to teach me right from left. Some people made an L with their thumb and finger; but in looking for the mole on my right wrist, I never learned to see it as a flaw. It was a help, a reminder; and now it is a memory of my older sisters, without whom I would be ill-equipped to face the world. 2) On the inside of my right elbow there is a narrow, faintly silver crescent. I remember the day I got this scar, though I was quite a small girl – small enough to sit on the kitchen countertop while I helped my mother fry mushrooms. I slipped, on that evening, and fell hand-first into the pan of boiling oil. On the palm of my hand there blossomed a blister larger than my thumb, but my mother doctored it so well that there’s no sign of it today. The only scar I was left with is the curve where my arm hit the edge of the skillet. I seldom notice it now, but I was all of twenty years old before I could enjoy the taste of mushrooms. 3) Over the tops of my arms a hundred freckles are scattered – mementos of seven summers spent in the sun, running a mower for my daddy’s lawn care business. I was never a fan of outdoor work but I enjoyed working with my daddy, and despite the two years since spent in housewife-ing and teaching and office work, the freckles remain, a memory of the days when I worked to earn the position of my daddy’s right-hand girl. 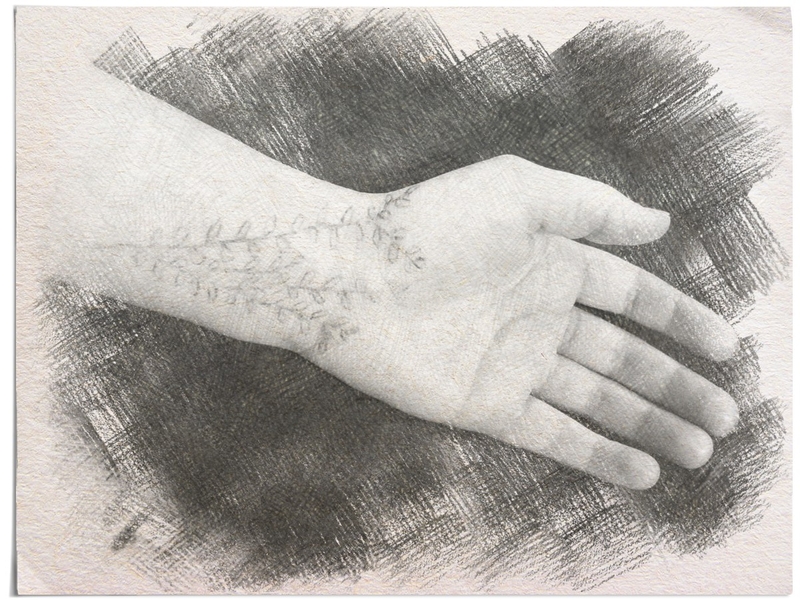 4) On the soft insides of my forearms the fourth story is written in whisper-thin lines of fading white. Soon they will vanish, and I could choose to let their story vanish with them. I’ve never told it to anyone, this story of a lost teenage girl for whom alone was definitive, both as a blessing and a curse. Alone was the place where I became acquainted with myself, but alone was also the cage where no one could reach me. There were too many thoughts, too many emotions, too tightly locked inside of me, and somehow when my arms stung red in the dark, it soothed for a moment the deeper ache in my soul. Sometimes, still, when I am very tired and my thoughts press in too heavily, I miss the pain that felt like a balm. Last night was like that. But lost has become He saved me, and alone is now where I feel safest in Him. The skin on my wrists is transparent and the blood branching blue underneath is bought blood. Once created and once purchased is twice owned, and I have no right to turn it red. There are stories written in the skin of my arms: stories of my sisters who taught me so much; stories of my mother, who was patient when I wanted to help and tenderly faithful when I was hurt; stories of weeks spent in the comfortable near silences of practiced understanding with my daddy; stories of fighting my battles alone, of losing and being lost, until the day I was found and I learned to surrender – not to the battles, but to the One who conquers all. What a wonderful gift you have, jen, thank you for sharing once again! I realize that this was written quite awhile ago, but for some unknown reason, I came across it today. I realize I don’t know you, but this touched me in a painfully beautiful way. It brought tears to the eyes of one who for some reason can’t cry very much. Thank you. Thank you. As a writer, there’s nothing that means more than hearing my words touched someone. Thank you for telling me so.